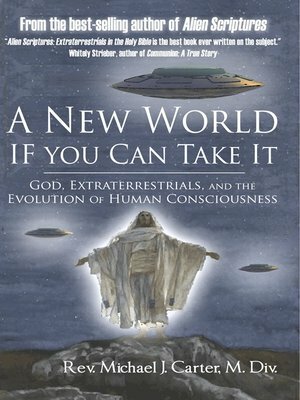 Author of Alien Scriptures: Extraterrestrials in the Holy Bible and frequent guest of History Channel's Ancient Aliens series, Reverend Michael Carter, takes ancient astronaut theory to its next developmental step in his latest work, A New World If You Can Take It: God, Extraterrestrials, and the Evolution of Human Consciousness. Drawing on the works of such giants as Erich von Däniken and Zecharia Sitchin, it is well established that many in the UFO community believe that our ancient ancestors mistook extraterrestrial visitors for all powerful deities. Reverend Carter builds on this outlook by reexamining religious and spiritual philosophies and demonstrating how off-world intelligences shaped early religious teachings.The concepts presented in this book are not for the spiritually faint of heart or those with closed minds. Reverend Carter courageously asks, and answers, the next rational question: How can one reconcile spirituality and faith with a belief that ancient astronauts influenced the events depicted in humanity's greatest holy texts? Expanding on this line of questioning, Reverend Carter explores how expanding one's spiritual consciousness may actually lead to the next step in human evolution.Are you searching for more out of life? Do you have questions about what you have been taught by organized religion? Do you feel that if the world's diverse population recognized their shared singular tradition of extraterrestrial involvement in human affairs would foster peace and prosperity for all of humanity? Can the messages from present day Star Visitors to contactees hold the key to unlocking your spiritual potential? Reverend Michael Carter encourages his readers to ask these questions, research for answers, and embrace what resonates with your heart. Are you ready for a New World?